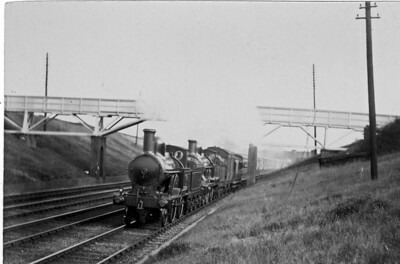 An ‘Improved Precedent’ or ‘Big Jumbo’ pilots a four-cylinder compound ‘Jubilee’ class 4-4-0 on a down express. But where and when ? This was taken by Dr. Budden in 1900 and has the train passing under the wooden footbridge (bridge no.38) which was situated between the Metropolitan bridge (just visible in the background) and bridge 39 which was later to have the entrance to Kenton station. A popular place for pictures the wooden bridge features in at least 8 of the cards published by Pouteau but it only survived for a few more years and was replaced prior to any work being done on the new line. Perhaps someone can give a date for this? The replacement features in a number of pictures both prior to and during new line work. Peter G. Scott's book 'The London & Birmingham Railway through Harrow, 1837-1987' (London Borough of Harrow, 1987) has a similar photo taken from a few yards back, showing 'Charles Dickens' on a Down express in 1900, so probably also taken by Dr T. F. Budden on the same occasion. Peter says: "some ten years later the footbridge was rebuilt". There's another photo on the same page, showing the wooden footbridge and dated 29th August 1906. So - is there any advance on 1906? ”Any advance on 1906?” - I guess when the New Line was built. It would need to be extended then, so they probably renewed the whole thing while they were at it. I think construction work started around 1910 and it was opened as far as Harrow in June 1912.